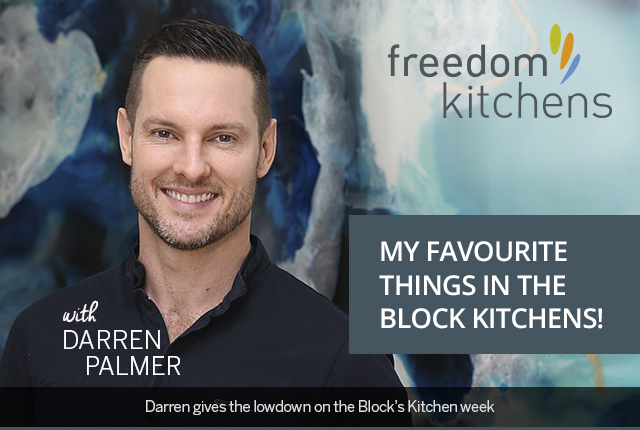 Kitchen Week is one of my favourites on the show and this series’ Freedom kitchens were no exception. The level of creativity blew me away and here I explore each kitchen and list out my favourite elements. The pair’s ‘In-deco’ design strikes a perfect balance between modern industrial and Art Deco touches that really works with the building’s period architecture. I love the kitchen’s Natural Halifax Oak table that replicates the rich appearance and texture of solid oak. 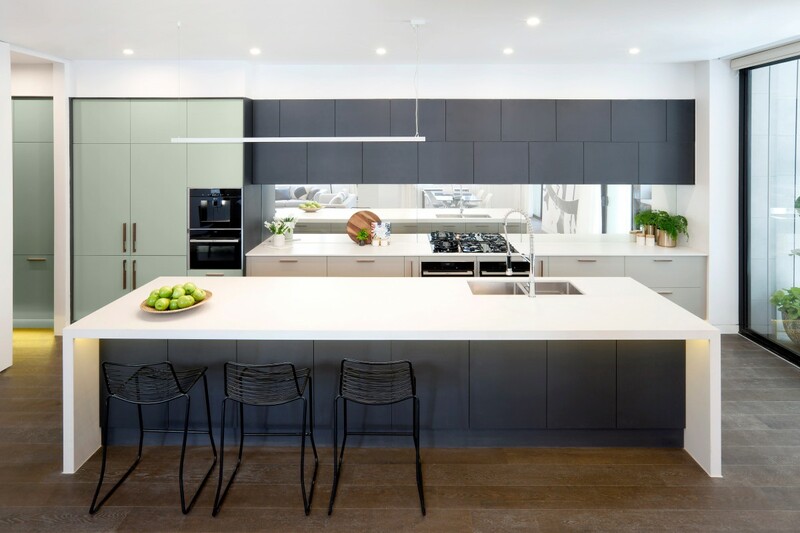 The harmonising Rural Oak blockout beautifully frames the deep and dark cabinetry and ovens. 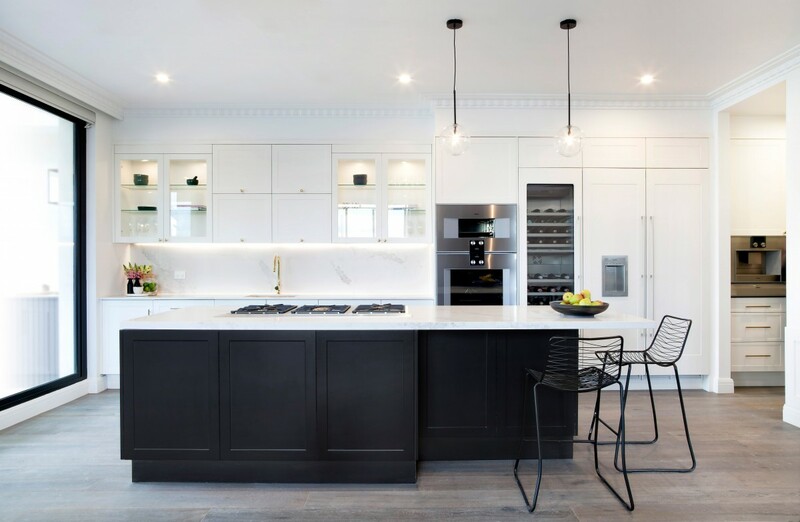 Caesarstone Cosmopolitan White benchtops complete the look with butler’s pantry, ample storage, island recess and NEFF apps providing high-end functionality. Carleen and Dan have created a bold and luxurious design that also pays homage to the beautiful Art Deco building this kitchen lies within. The warmth and texture of the Cherry Riftwood cabinetry gives a sense of drama to the entire back run. 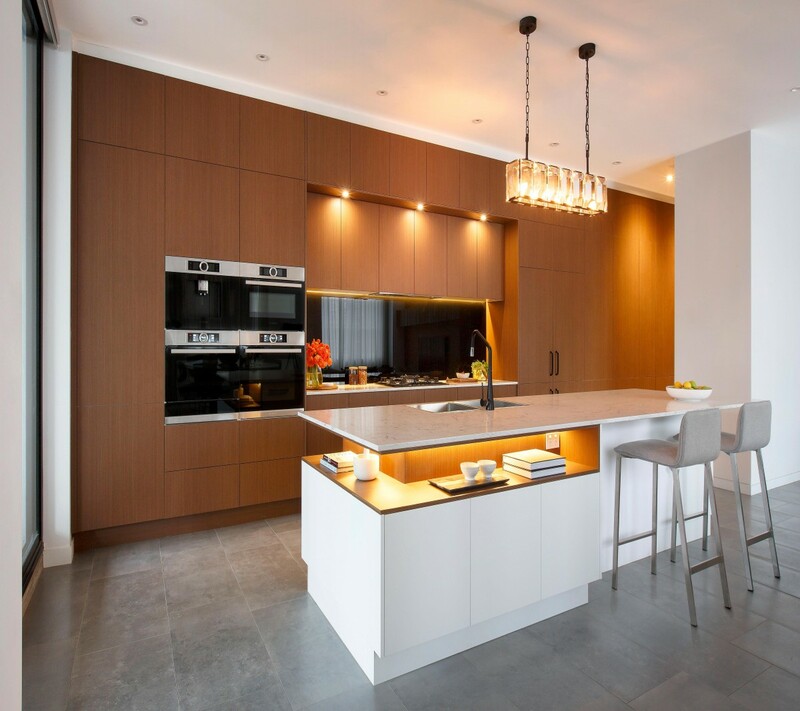 The opposing Island White Satin cabinetry is cool and smooth, contrasting with the timber tones. The White Attica benchtops – a new marble-look design – bridge the cabinetry through a white base with dense, dark grey veins. Integrated appliances by Bosch, a display nook within the island bench and heavy use of touch catch cabinetry throughout further enhances the modern design without compromising the aesthetic. The boys have created a modern kitchen with an Art Deco twist, fitting the heritage of the building. Colour and texture have been used in refreshing ways to celebrate Art Deco whilst keeping clean contemporary lines. Top cabinets in Black Riven are offset to create interest and play on the Deco style. Paired with Newbury Baye and Bayleaf to create a fresh colour palette. An entertainer’s dream, the design features ample storage throughout both the kitchen and sizable butler’s pantry. 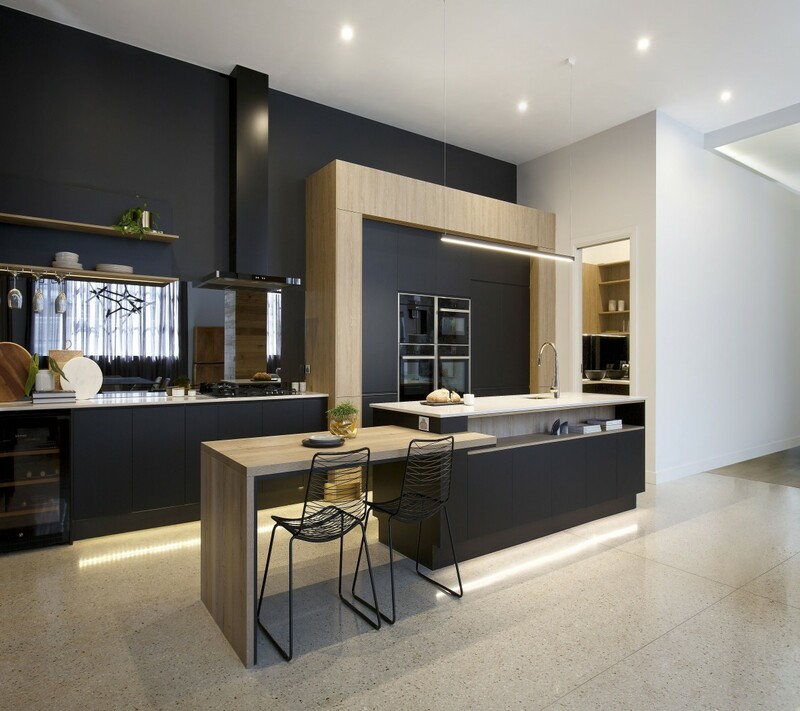 Using chic NEFF appliances and stunning Caesarstone Fresh Concrete benchtops. Julia and Sasha have created a modern design with touches of Shaker style that epitomises luxury and glamour. Caesarstone Statuario Maximus benchtops and splashback combine perfectly with the matte white and black, Shaker-style cabinetry. With high-end Gaggenau appliances throughout, this is a kitchen that demands attention. I love the Bright Brass cornet handles and tap with metallic sink that add luxurious touches to the timeless design. A butler’s pantry offers generous storage with open shelving, integrated dishwasher and coffee machine. By pairing bold blue tones and a built-in Bluetooth sound system, Kim & Chris have created the ultimate entertainer’s kitchen. 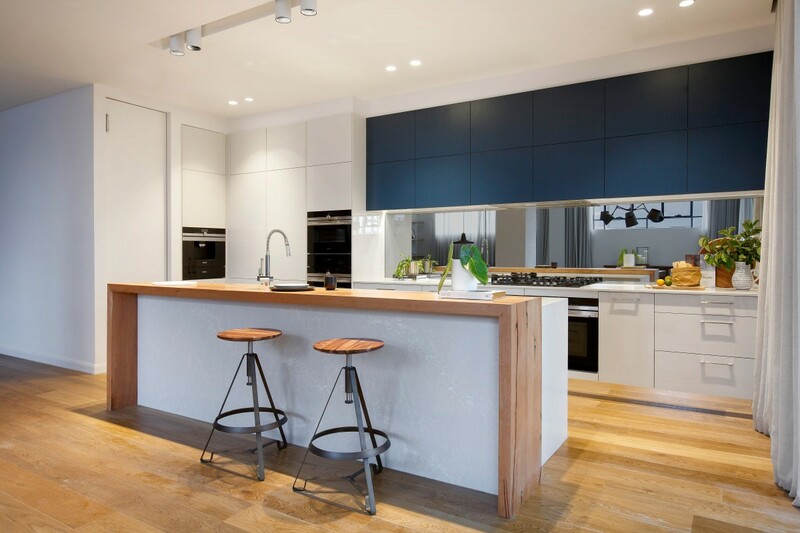 Combining Alaskan Gloss cabinetry in Royal Oyster with Flair Deep Sea top cabinetry and Caesarstone Alpine Mist benchtops makes this kitchen both stylish and functional. The look is completed by Siemens appliances and an integrated Bluetooth sound system that turns cupboards into speakers. With generous provision of storage and drawers plus a butler’s pantry, this is a kitchen that appeals to lovers of refinement and modern design. To create a kitchen that is the best on your block, book your free, in-home design appointment with Freedom Kitchens now or download our new Spring catalogue for more inspiration.